Alright, alright, alright! After the twin debacles against UN-O and NJIT, many thought Marquette was dead in the water. A third place finish in the Orlando Classic is a lot better than what most fans were expecting. Marquette used quickness, defensive pressure, and surprisingly effective shooting to beat two Power 5 squads in Georgia Tech and Tennessee, and hang tough in a loss to a top-20 Michigan State squad. Marquette rides that momentum back from Orlando to the Bradley Center for a tilt with its most intense rival, the Badgers of Wisconsin. This will be the third matchup against a B1G team for Marquette this season, and promises to be the toughest one yet. The Game Plan: The trip to the Bradley Center is the first real away game for the Badgers. They looked fairly dominate in their first seven games (though Georgetown did nearly pull the upset) before getting handled in the Kohl Center by the Blue Devils of Duke. Duke exposed what may turn out to be an Achilles heel for the Badgers. Wisconsin struggled to guard Duke’s much quicker guards. Jones, Cook, and Sulaimon led the way with 22, 13, and 14 points respectively. Smith-Rivera of Georgetown went off in a similar fashion scoring 29 points. If Marquette is to win, they must put the ball in their guards’ hands. Three different Marquette guards have already logged 20+ point games this season. If 2/3 of them catch fire and use their speed to beat their defenders, Marquette will have a chance. Another key player for Marquette could be Deonte Burton. #Bane has yet to truly break out, though he did have his first appearance on Sportscenter with a thunderous dunk against Michigan State. Saturday could be the ideal matchup for him to have a marquis game. Wisconsin has some talented guards in Jackson and Gasser. They also have talented bigs in Dekker, Hayes, and Kaminsky. But they have little in the way of traditional wings. Dekker plays the three but at 6”9 is much bigger and slower than a typical college wing. Deonte may be able to use this to his advantage and create some mismatches with the Badger defense. On defense, Marquette needs to pray for a cold shooting night from the Badgers. The three games in Orlando seem to indicate that Marquette is nowhere near ready to play man to man and most rely on zone. Every player in Wisconsin’s rotation besides Vitto Brown (last man in the rotation) has hit at least five 3-pointers this season. With seven deep threats on the floor, Marquette’s zone is likely to get toasted. The key player to stop is Frank “the Tank” Kaminsky. The senior seven footer is averaging near a double double and is 13/31 from deep (42%). With Marquette most likely relying on zone, they must allow Frank his outside shots and focus on denying him any easy looks or offensive rebounds. Fans and analysts have been commenting on the different look Bo Ryan’s team has this year. Don’t be fooled. They are still the same slow paced Badgers from previous campaigns, they rank 314th in adjusted tempo per KenPom. A slow paced game play into Marquette’s hands. If they can force double digit turnovers, the Golden Eagles may just pull off the upset. Best Case: Duane and Carlino catch fire at the same time. Knocking down a combined nine 3-pointers. Burton uses the floor spacing created by the long range snipers to attack the slower Badgers. #Bane ends up with 19 points and fouls out Dekker and Hayes in the process. Marquette’s zone allows the Badgers nothing inside and they force up three after three. A lot of them fall, more don’t. Kaminsky goes off for twenty points but none of his teammates follow suit as all of them end up with single digit scoring. Marquette ends up shocking the badgers with a three point win and Marquette fans storm the court. To add insult to injury, Kaminsky takes another knee to the groin. 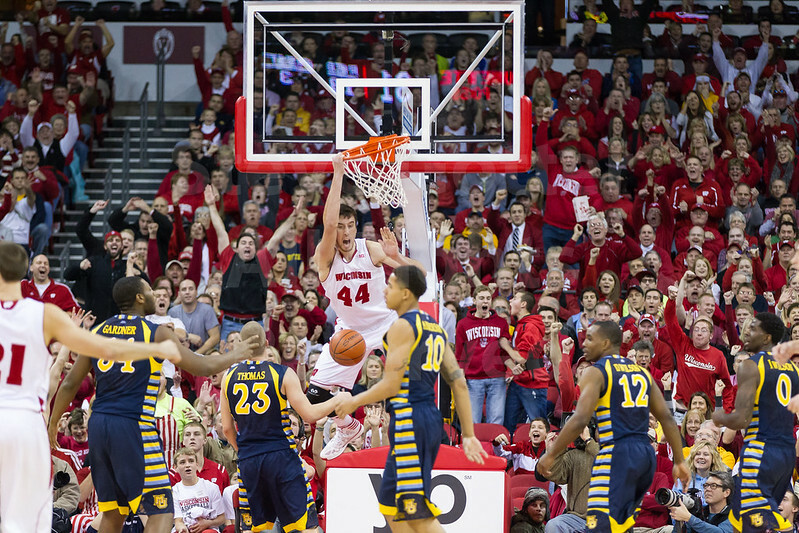 Worst Nightmare: Marquette plays the zone and the Badgers respond by shooting over it. They hit more shots than an LMFAO song. When the shots aren’t falling, the Badgers use their massive trio of Dekker, Hayes, and Kaminsky to snag easy rebounds and make the putbacks. Duane continues his campaign to rename “Jimmer range” to “Duane range” but misses on several ill-advised NBA range threes. Carlino and Derrick attempt to get into the lane only to have their shots sent away by Kaminsky who ends the night with five blocks. Wojo attempts to punch through another whiteboard but only ends up with bloody knuckles. Badgers blow out the Golden Eagles by 17.